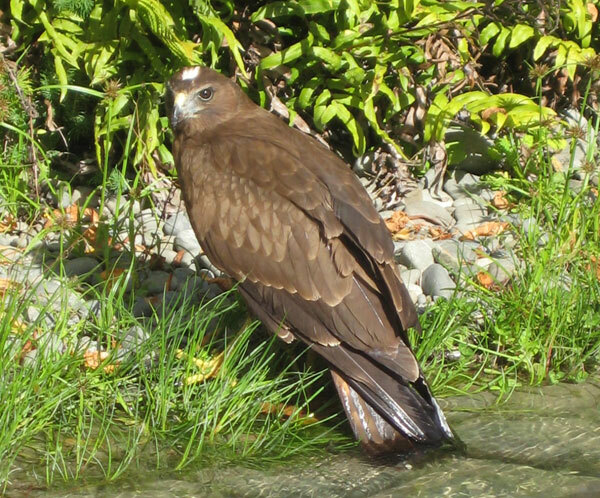 For some days in autumn, 2010, the Hazelnut Orchard was the ground-hospital for a beautiful chocolate brown female harrier hawk. She was found dazed and confused on the ground by Rusty the dog, and a phone-call to a bird expert told me she was likely starving. My first and only job was to feed her back to health. 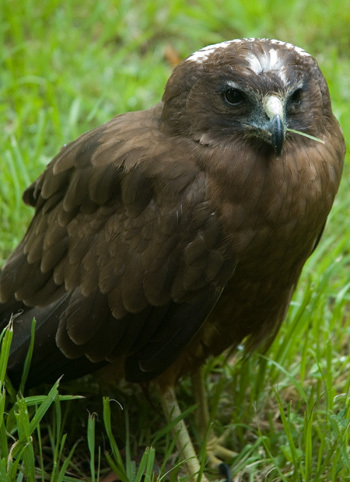 Raw pet meat was a good start, but harrier hawks are scavengers - for a complete diet she'd need plenty of 'roughage'. The expert suggested I scoop up roadkill, and get my neighbours to help by dropping off dead rodents or rabbits. I would need to feed her for up to two weeks. Poor bird! For the first day she just sat there in the grass - I could easily have picked her up or even hand-fed her (but I didn't). She was weak and starving, and gobbled up the pet meat. On the second day I found her a dead rat, and a dead blackbird. No more needs to be said. On the third morning two young boys came to the door asking about odd-jobs to earn some pocket money. They came to look at the hawk, and I said I'd pay them for dead rats etc. (my adult friends had been rather sniffy about helping with this). Jackpot! They sold me a very recently (and legitimately) dead hen. My reputation in the community may now be a little tarnished - augury, anyone? But my hawk spent the next twenty four hours happily standing on her hen feasting like a queen. And then she flew - a little at first, in a straight line a meter above the ground. Later that afternoon I thought I saw her doing a graceful upward spiral into the blue sky. Yippee! What a beautiful bird. 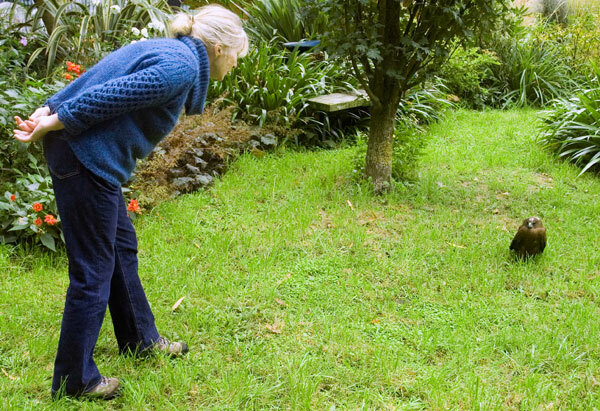 I hope she stays near my orchard and keep it clear of rabbits and mice for me. And sorry about the hen, but it did the trick! My hawk is back, bumbling around on the ground again. Mind you, I seem to be feeding a few other fully mobile birds. Oh well - it's back to procuring dead rodents (thanks, cats) and rabbits (thanks, Rusty the dog) and hoping that one day soon my hawk will be able to fly properly. Sweet success. She can fly properly. And she's gone.